I am fortunate to be living in Colombia, the most wildly misunderstood South American country. But that is not for me to explain to you. While today is a regular working Thursday in the rest of the world, in Colombia it is Saturday. Holidays, saint’s days, (and general I don’t have to go to work days) are more common here than maybe any other place on earth. I sleep in. I clean the house and take a shower. I take the dog for a walk and plan to meet a friend for coffee. But even that has to wait until mid morning, because nothing will be open before 10:30 so I have a window of opportunity, wide open. Food is essential to health. I am making myself healthy and will savor the results of my efforts. Cooking your own food is important because it guarantees the quality (or at least the knowledge) of what you eat. Food you cook at home is healthier than what you can buy because the ingredients are fresher and there are no mysteries about it. Everyone should cook. It seems like the most obvious cure to so many ills. …And then I remember that not everybody has the day off, or ever has the time to cook this way for themselves or their family. How far have we gone as a culture that the most fundamental life-sustaining act has been outsourced to the extent that many people my age don’t even know how to cook or shop for fresh food? I am fortunate to live in a country where it is still cheaper to buy vegetables and fruit from a local market than it is to buy soda and chips. I am fortunate to have the time to devote to my own health and enjoyment through cooking. I remember living in the USA, working so hard that all I had energy for at the end of the day was take-out and TV. I don’t know which part of me was dying faster, my body or my soul. This is not only an American affliction. I fear that we are exporting it to developed and developing countries along with our American Dream and Coca Cola. Even here in Colombia the arrival of McDonald’s, Subway and Domino’s is celebrated with an exuberance I haven’t seen since the fall of the Berlin Wall. With an abundance for fresh fruit and excellent quality meat people still choose the new American product regardless of physical or economic health. Meanwhile I am still chopping and dicing. To my left is a heaping bowl of Pico de gallo; red, green and spicy. 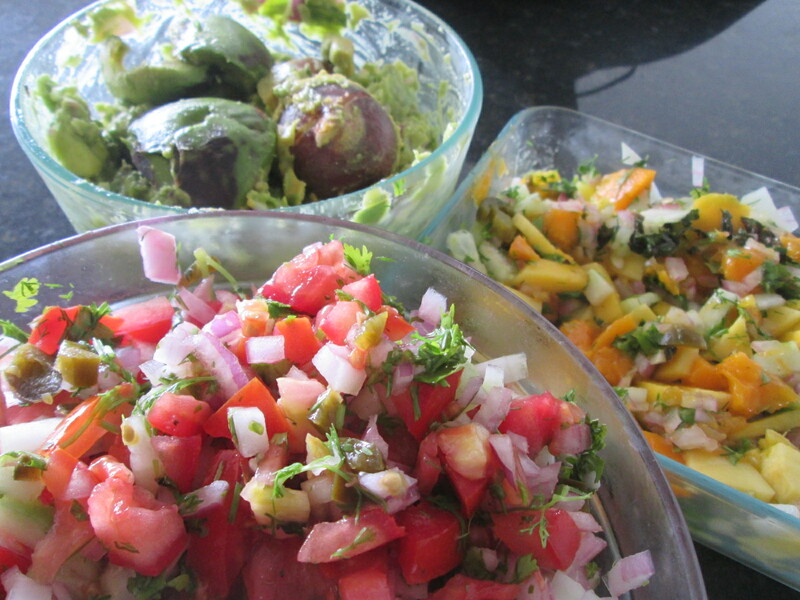 To my right is a new recipe to satisfy a recent craving, mango salad/salsa. Yellow, orange and sweet. And the green temple of guacamole erected before me promises salvation, of a kind. Salvation from hunger, salvation from heart disease and arthritis, diabetes and maybe even cancer. This is what my morning has yielded, delicious piles of edible rainbow foods. To my health and to yours. This entry was posted in Nourishment and tagged cooking, featured.